Walking for daily exercise is low-impact, safe and free. It can improve cardiovascular fitness and strengthen muscles and bones. 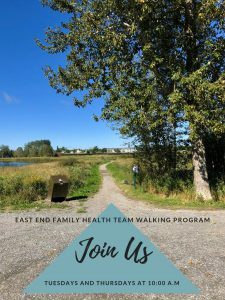 Join our community walking program. We walk indoors and outdoors (weather permitting). When: Every Tuesday and Thursday at 10:00 a.m. Where: Meet in the waiting area of the East End Family Health Team Clinic. Click me for more information! The Craving Change program aims to help participants understand why they eat the way do and find strategies for changing their relationship with food. Your facilitator is trained to use the Cognitive Behaviour Therapy (CBT) model in a group format to guide you through the process of change to ultimately help you improve your health. Craving Change is offered throughout the year, so if you’d like to be notified of our next program offering, please contact the clinic. This all-inclusive program is like no other deal you have encountered. Sign up for free and cook, eat, exercise, and learn…all for free! Attend 1.5 hour sessions once a week to either learn alternative ways of cooking or learn the ropes around various physical activities. Programs operate for 12 week sessions, so sign up asap on a first come, first serve basis! Our clinic offers 3 free pool passes to the Archie Dillion Sportsplex Pool to those who would like to try different fitness classes that are offered by the pool. Swimming has physical activity benefits for overall health, especially for those with joint disorders or conditions that may benefit from non-weight bearing physical activity. Ask for your free swim passes today! Looking to rise and grind? Attend our boot camp class to get that early morning sweat on! Classes focus on cardio, strength, and endurance training. Go get it. Diabetic? Struggling to get moving or wanting to maintain those pristine sugar levels? Sweat out that sweetness with our new exercise class for patients with diabetes! Looking to be more physically active, but do not know how to use the gym equipment? Maybe just looking for some motivation? Well this is the program for you! Get ‘Fab Fit’ with the ‘Team who’s Fit’! The Stand Up! program is a Falls Prevention Program for seniors 65 years and older. This program is a 12 week long program that involves balance, strengthening, and flexibility exercise classes twice a week for 1.5 hour sessions. A certified Stand Up! instructor guides the participants through the exercises and provides health promotion to educate seniors on falls prevention.